Since when was a seminary open day as much a feast for the foodie fanboys and girls as for the folks looking for spiritual nourishment? The folk who run Redemptoris Mater Seminary in Chester Hill, which will be throwing its doors open to the public this Sunday (11am-4.30pm), know that those groups are in no way mutually exclusive – often they are the very same people. 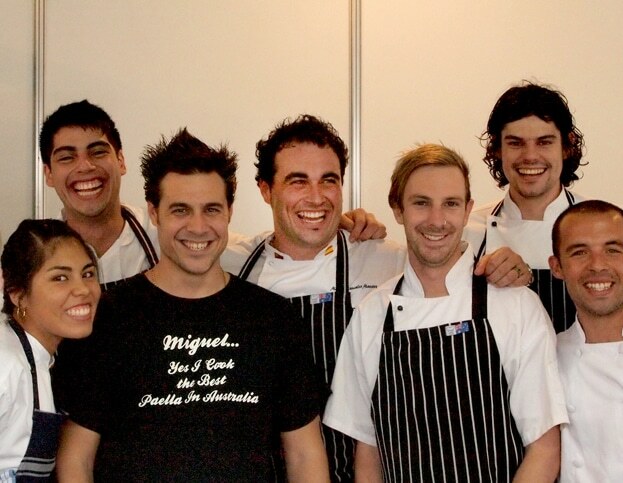 In a day which also promises to reveal exactly what goes on behind seminary doors, the seminary has secured the help of celebrity chef Miguel Maestre, who’ll be firing up some of his signature paella. Another, perhaps more offbeat, draw card is a small piece of the great 17th century saint and servant of the poor, St Vincent de Paul, patron saint of the seminary on whose feast day the open day coincides. Kicking off at 11am with a moment of prayer, seminarians will offer guided tours throughout the day, with a barbecue lunch, including Miguel Maestre’s paella, scheduled for 12.30pm, with vespers (evening prayer) to round out proceedings from 4pm. Remptoris Mater rector Fr Eric Skruzny says he looks forward to welcoming people to the complex. “It’s a chance to meet us and to get a taste of the spirit of what is happening here, what’s been done, and the fact that it’s not over yet,” Fr Eric told The Catholic Weekly. With its clean lines and warm interiors, the seminary opened in 2012 in a very liveable but unfinished state, after four years of construction. Several of its facilities remain incomplete and underutilised while a much-hoped-for chapel has been designed but is yet to be funded. Fr Eric told The Catholic Weekly of the seminary’s inspired origins, earlier this year. “This is the place we were meant to be,” he said, remembering the small chapel that once occupied the site, and the faithful community of elderly women who used to make special prayers for vocations there.